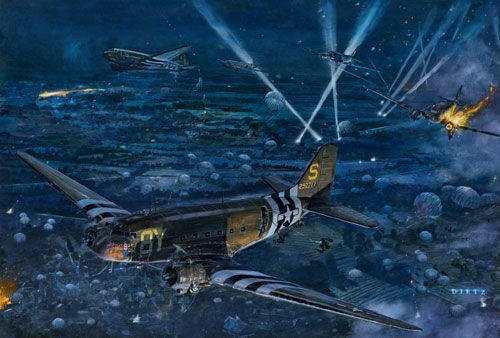 James Dietz Hand Signed and Numbered Limited Edition Print:"On the Night Before"
Size: Image Size: 25" x 16.875" / Print Size: 31" x 23.375"
The Class of 2016 proudly presents the Command and General Staff College with an original oil painting honoring the 75th anniversary of airborne operations by featuring the Allied invasion of Normandy, France in 1944. In 1940, less than 45 days after the formation of a test platoon, the first Army paratroopers jumped into history as the first Americans to parachute from an aircraft in flight. By the end of 1941, two combat units, the 501st and 502d battalions, along with the first glider battalion, were organized and activated. Growing from a new idea to a capability which delivered powerful formations behind enemy lines, the parachute and glider carried American troops to combat in Algeria, Italy, France, Holland, Germany and the Philippines during World War II. The Class of 2016 is privileged to have the opportunity to hear first-hand accounts from a paratrooper that served during D-Day, Operation Market Garden, and the Battle of the Bulge. As one of many jumpers, Mr. James H. "Pee-Wee" Martin (3rd Battalion, 506th Parachute Infantry Regiment, 101st Airborne Division) parachuted from a 440th Troop Carrier Group military transport aircraft into Normandy at 12:30 AM on 6 June 1944. He fought in Normandy for 33 days before his unit was relieved of their mission duties. His service to the nation in a time of global uncertainty and as part of an infantile mission capability is a testament to the importance of strong leadership abilities, critical thinking, and innovative problem solving skills necessary for every member of the armed services. Depicted here are C-47 Skytrain military transport aircraft from the 440th Troop Carrier Group inserting units of the 506th Parachute Infantry Regiment into Normandy, France on the evening of 5-6 June, 1944. The nose art and tail number of the lead aircraft (tail # 292717) are historically accurate and depict the actual markings of the aircraft used by Mr. Martin's battalion commander and staff for the Normandy invasion. The nose art of the lead aircraft details a man wearing a top hat with coat tails pointing to the name of the aircraft "STOY HORA," which translates to "I am here for you right now." These powerful words embody the commitment and trust between air and ground forces that endures today. This painting commemorates the 75th anniversary of the American paratrooper and is dedicated to the bravery of those who volunteered to take that leap of faith.